Today I have a very special cover reveal for you. Lauren McKellar is one of my fellow Aussie Owned and Read girls, and she is full of awesomesauce. 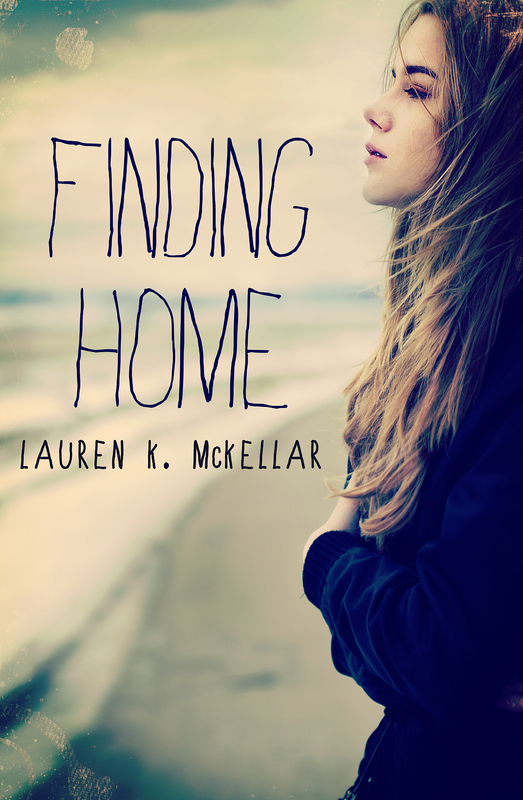 I'm very proud of her, and so pleased to be able to participate in the first glimpse of her debut novel, Finding Home, which will be released October 1, 2013. Isn't it beautiful? It's so simple and elegant, and full of feeling. I can't wait for its release. ‘Look, I have to go. Can we talk about this later?’ Dad was asking Mum. Joe had shut the door behind him, and it was a good thing he did too, because when Dad had finished speaking, Mum picked up an empty bottle of Grey Goose vodka and threw it at his head. She missed, missed by a mile, but that didn’t stop the bottle hitting the wall behind him and shattering into thousands of tiny pieces. ‘Jesus!’ Dad exclaimed. He turned around, surveying the damage. ‘Oh, look what I did! Can’t have clean-cut Stevie D trashing the green room. People might talk!’ Mum’s voice dripped with sarcasm. It sounded hoarse, no doubt a result of the hours she’d spent alternating between crying and screaming up until now. ‘And do what? I can’t afford your habits any other way. If I don’t sing, you have to get a job.’ Dad shook his head. I inched around behind them and started to pick up the pieces of glass. They were all different sizes, and some had gotten stuck in the carpet. They required a bit of twisting to retrieve, but the others I could pick up with ease and place in my hand. ‘What do you want me to do? I don’t have any skills. And there’s clearly only one thing you think I’m good at these days,’ Mum said, leering. She pulled at her top, exposing her décolletage. I focused on the glass again. I counted each piece in my hand. Thirty-six, thirty-seven, thirty-eight. On the fortieth piece, a shard broke through my skin, spilling bright red blood. Funny. I hadn’t thought my skin would be so thin. ‘Amy, you’re hurt!’ Mum pushed past Dad and came to kneel next to me. ‘What are you doing?’ She knocked my hand with her own, and the pieces of glass flew up into the air and landed back on the floor. All my efforts — ruined. ‘Let me see,’ Dad said. ‘Get the hell away from her!’ Mum yelled, raising her voice again. ‘Do we have to do this in front of Amy?’ Dad asked. I felt them turn to look at me. Did they think I hadn’t heard? That the fights they’d been having all day in the adjacent hotel room hadn’t resonated with a hatred that travelled through walls? ‘Please don’t,’ was all I could say. But it was enough. Dad left the room, and Mum tended to my hand, spilling some vodka to cleanse it before wrapping it in a spare t-shirt. Only they didn’t. They got much, much worse. This cover reveal was hosted by Hardcover Therapy. This sounds really good. Thanks for sharing about it.